The springs were just beautiful. Our ride didn’t start till 8:30 and it ran till 1pm, well past “golden hour.” Yet I kept pulling out my wide-angle lens to photograph the beauty around me. Look at the crystal-clear waters! They really are that blue and green. All around us kayakers were out for a cool morning paddle. It made me want to learn to kayak. What a neat way to enjoy Florida’s natural beauties. There were turtles all over the place! Fairly tame ones, too. 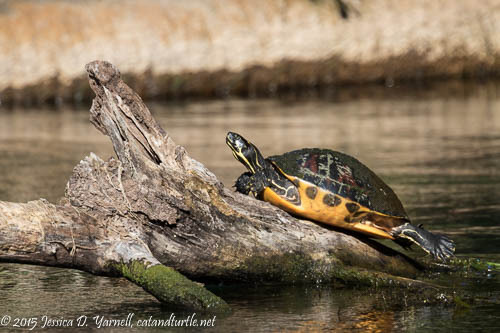 I’m used to the skittish turtles around our lakes that dive into the water as soon as they see a human approaching. I guess five humans in a boat are less intimidating. Of course I had to take lots of turtle photos for Rich. Yep, you knew you wouldn’t have to wait long for a photo of a bird. A Wood Duck, to be precise. Wood Ducks were plentiful on this particular morning, resting on small branches along the water’s edge, or swimming near the shore. We saw males, females, and lots of juvies. It was fun to be able to approach them. Like the turtles, they were not so concerned about the photographers floating by in the boat. 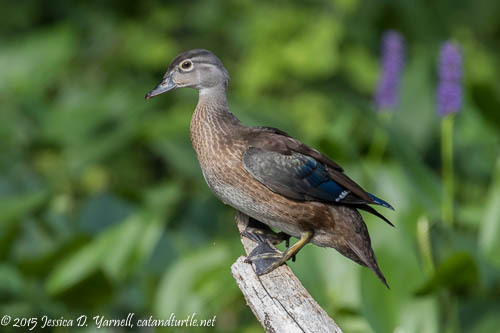 We saw several Wood Duck families that included small chicks. They are so cute! This family had a bit of a scare. A hawk flew by and tried to dive-bomb a chick. The mom chased off the hawk and signaled to her babies to head to the sheltered waters under the trees. I was really glad we didn’t see a chick get carried off. 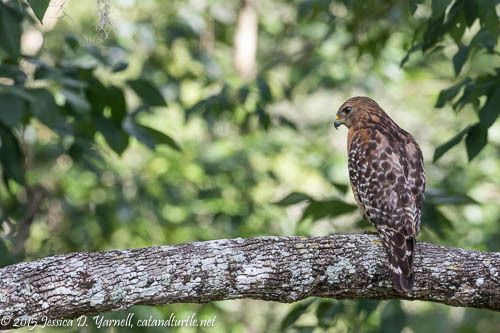 This is a different Red-Shouldered Hawk, not the one that tried to commit duck-icide. So I don’t mind sharing his photo. He was perched on a nice branch framed by the pretty green tree leaves. A kayaker alerted us to this mama alligator, who lay resting with her baby quite close (look on the left side of the photo). I was glad I was in a pontoon boat and not a kayak as we approached the pair. I see alligators all the time, so often that I usually don’t photograph them, but I don’t really like being around them. It was nearing 12pm and we still hadn’t seen any monkeys. I enjoyed the breeze as it brushed against my cheeks, glad that I had taken both the Beast and my wide-angle lens. I was perfectly happy with my photos, even if we hadn’t seen a monkey. 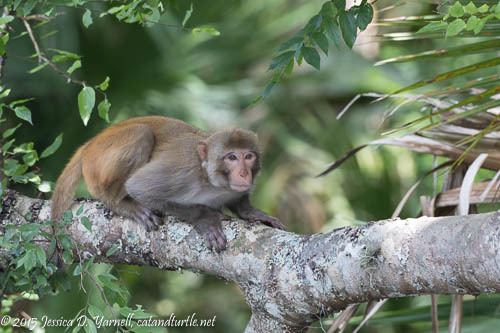 Then as we headed back to the dock, another kayaker said something about seeing a lone monkey in a particular tree. We approached and score! there was a monkey. He posed nicely for a few minutes as we floated past him.